Digital Workflow in Reconstructive Dentistry is the result of efforts made by the academic team at the Department of Prosthodontics, University Hospital of Freiburg. It aims to build a fundamental understanding of the general principles, science, and clinics of digital dental medicine. 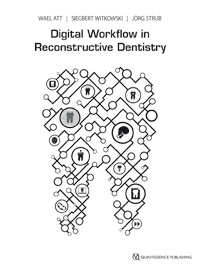 The information provided within these pages summarizes the various components of the digital workflow in reconstructive dentistry and discusses their advantages and disadvantages. Moreover, insights are provided about upcoming, game-changing technologies. By reading this book, students, clinicians, and researchers will gain and enhance their knowledge about digital dental medicine and identify the areas they need to focus on next in order to integrate the available technologies in their daily work. Clearly, the path of digital dental medicine will not stop here. Digital technologies have broadened and enriched the horizon, impact, and delivery of dentistry for decades, and will continue to do so.